Autodiscover is a web service running on Client Access servers that, as the name suggests, allows compatible client software to automatically discover a user’s mailbox settings by looking them up in Active Directory. But first the client needs to locate a Client Access server to connect to for Autodiscover requests. Internal clients (eg Outlook 2007/2010 running on domain-joined workstations) perform a lookup in Active Directory for which Client Access servers have an Autodiscover Site Scope configured for the Active Directory Site they are currently located in. 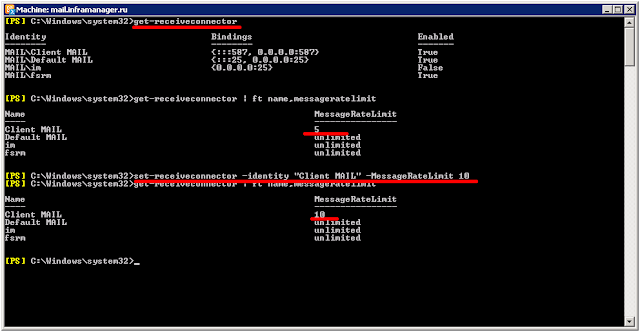 If the client can’t determine which Site it is in (eg the subnet is not defined as one of the Site boundaries), or there is no Client Access server explicitly configured for that Site, then the client chooses a Client Access server at random. The risk here is that the client will choose a Client Access server that is not the most ideal one in terms of bandwidth and latency. To resolve this you can configure what is referred to as “site affinity” by setting the Autodiscover Site Scope on Client Access servers. This makes sure that clients will connect to the closest Autodiscover instance. You can see the current Autodiscover Site Scope for all of your Client Access servers by running this command in the Exchange Management Shell. Ошибка почтового сервера "4.4.2 Message submission rate for this client has exceeded the configured limit"
с помощью командлета "set-recieveconnector" с указанием, собственно имени коннектора и нового лимита. Проверить текущий лимит можно с помощью команды "get-recieveconnector | ft name, messageratelimit"
Как узнать кто в данный момент подключен к серверу Exchange? 1. 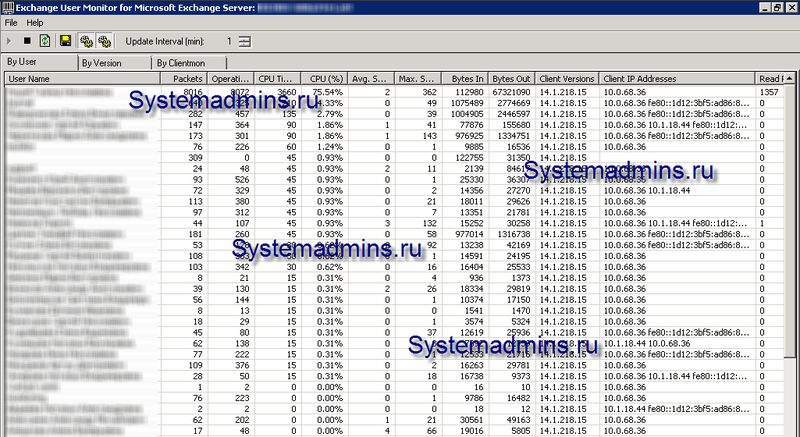 Для этого нам понадобится программа Microsoft Exchange Server User Monitor. Закачиваете ее и устанавливаете. 2. Запускается она из папки C:\Program Files (x86)\Exchange User Monitor. Как экспортировать почтовый ящик Exchange 2007 в pst файл? RPC over HTTP exchange 2003. Настройка клиента.